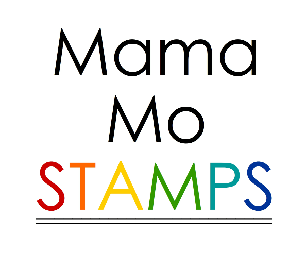 Mama Mo Stamps: Grand Opening Blog Hop! Catherine's online store is opening TODAY which means all of those wonderful Stamp of Approval goodies that you missed out on can now be purchased! I pulled out lots of Stamp of Approval goodies for this card! Um, hello! How much do you love the Geobuilders stamp set?!! I have a feeling this is going to be loaded into many shopping carts today. It's definitely one of my favorite and one of the most versatile stamp sets that we've had in the SOA collections to date. Use it as a border, an accent or build a background like I've done here. The possibilities are endless! To make my card, I started with a 4 x 5 1/4" piece of white card stock. I stamped the background using the Geobuilders stamp set in Silver Lining, Raspberry Fizz and Tuxedo Black inks. The centers of the larger gem images were stamped with a small accent stamp from Snowy Sayings. Next I die cut the medium sized tag from the Tag Buddies Fri-die set and added a thin strip of black card stock to the bottom. I die cut the Friend Fri-die twice from white card stock and once from Raspberry Fizz. I layered and adhered them for some added dimension. The sentiment from Girlfriends was stamped in black ink and then I assembled the card. I stamped a few little accent pieces and finished off the card with a twine bow. Time to start hopping along. 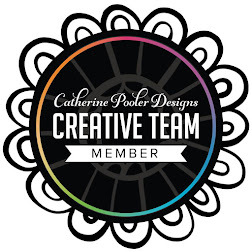 Make sure you leave comments along the way, Catherine is giving away THREE - $25 gift certificates to her online store. Love this stamp set. I am looking forward to getting one. The geo builders stamps can be modern or look Ike flowers!!! I love this! I need to play with my Geobuilders more! Amazing card Maureen, love the colors and how you made the background from the geo builders set. So pretty! Your cards are always great!! Love your card! Love the geo builders being used the way you did them. What a wonderful versatile set for so many occasions. Great color choices as well! I love how you combined the border stamp from Geo Builders with the friendship stamps and dies. Great pops of colour, too! wonderful card Maureen - love the pink and grey combo! This is so awesome! Love the colors!!! Great card. Love the colours used. I do love the Geobuilders stamp set - it's one of those that has so many possibilities. Nice! Love your color choices! Wowsers Maureen, I so wish I could crawl into that creative brain of yours! You always see them most wonderful patterns! Stunning girlie! Wonderful card love the color combinations. The geo builders look great used this way. 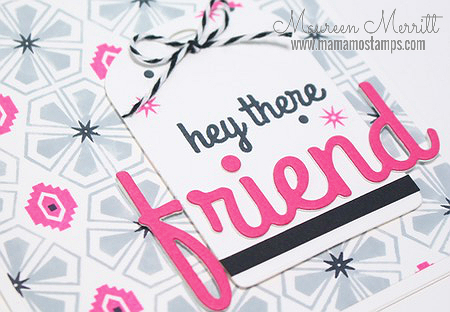 Like the size of the Friend stamp and how you separated the F.
Oh, I love this card and all of the products you used! The background is fabulous and that tag fits great! Thanks for sharing on the blog hop. The colors compliment one another...the "floral" geometrics are great. Beautiful card! Can't wait to shop the store. What a fresh color palette! LOVE the background you created and your card is beautiful!! TFS! Whoopee 👍I'm excited great colors ! Another beautiful card, Maureen. Love the color combination and the pretty background that you created! Love the colors, the background, the layout - love it all!! Love this card. I don't use the Geo builder set enough and I need to rectify that! Your card is amazing as always, Maureen. Love the colors, the tag and the sentiment. Beautiful card Maureen!! I love your color combination and your stamping is so clean and crisp. How the heck do you do that? That background is fantastic!! Awesome card. I like the colors you chose. Great stamp set and beautiful card. Love the gray, black and white colour combo! I love the subtle gray and bold pink and black! And yeah...how about that awesome geobuilder stamp...LOVE that stamp so much!!! Delightful color selection and style. Love the way you used the Geo-builders set. Beautiful!!! I wish I could stamp as straight as you do. Groovy piece of modern art, Maureen! This would make a fabulous quilt pattern. :). Love the card very pretty. WOW, this is totally perfect, looks just like patterned paper. I like the pink accent color, FAB card! Loving the geo-builders stamp set!Great card! WOW, the color combination is awesome! What a great card. 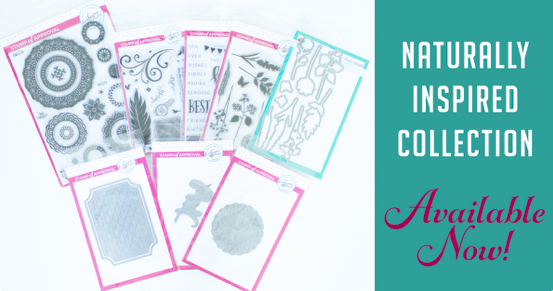 Love those Stamp Nation stamp sets. Great card. Beautiful background build-up with the geo builders set. I love the muted gray with the raspberry throughout. Great combo! I love the color combo! Beautiful card!! So many creative uses for this geobuilder set! A definite must have! Wonderful card! Want geobuilder stamps especially after seeing your card. Awesome sauce! Love you card and the design. Always love pink and grey color combo. Super job! Wow Maureen, you did a magnificent job on this card. You are so creative. I'd never think of that. Thanks for the inspiration. WOW Maureen, I have to say that your custom background made me want to run to my craft room and grab that set and CASE you. Love it so much. And the color scheme is soft and inviting as well. Thank you for the inspiration with the Geo Builder set. Hey Mo, I love your card...Your background is amazing!! You've done a beautiful job making the sentiment POP!! Thanks for sharing!! Really like this stamp set! Your card is great! Wow, never seen a card like that. It is beautiful!! I love the pop of pink. So pretty. This I so citing! 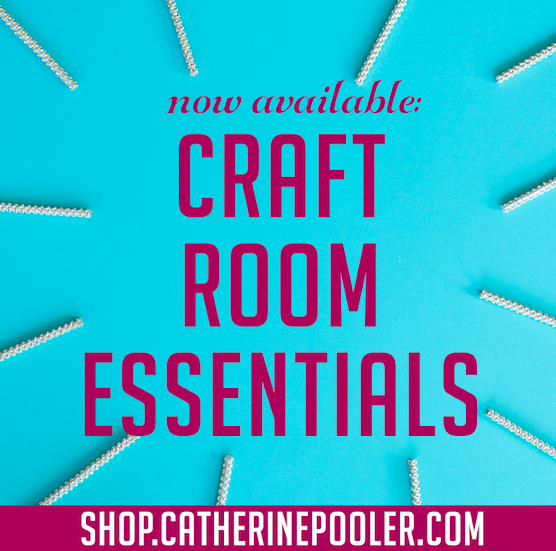 So many pretty things to use! Maureen, I love your card and those stamps from Geobuilders are lined perfectly !! As always you have created such a beautiful card that is just my style. I wish I could be as creative as you. Cute card! I love that Geobuilders set! LOVE YOUR CARD!! Sooo pretty! Thanks for sharing! Really pretty card. Love how EVEN everything is....beautiful. I love these blog hops! Geo builders in GRAY! I swooned! So pretty with this color combo. Love the background, I haven't used the geo builders much, just haven't seemed to have the time, but this is getting my creative juices going!!! I just love the geo builder stamp set. I love what you did with it. I have this kit and love it. Wish my budget would allow me to have all of the kits. I love the geo builders. Great card! I'm lovin' the geobuilders background! I love your background and the colors you used. Love the GeoBuilders set Maureen and I LOVE your card. Amazing! Great card! This is one of my favorite stamp sets too!!! Very cheerful card. Love the colors. Another great way to use this stamp set. I will have to try out this design. that colour combo is beautiful. the pink really pops with the grey. Gorgeous card, Maureen. Love the grey and pink together. I found out I could really use a soft grey ink, so maybe this Silver lining ink is just right for me. 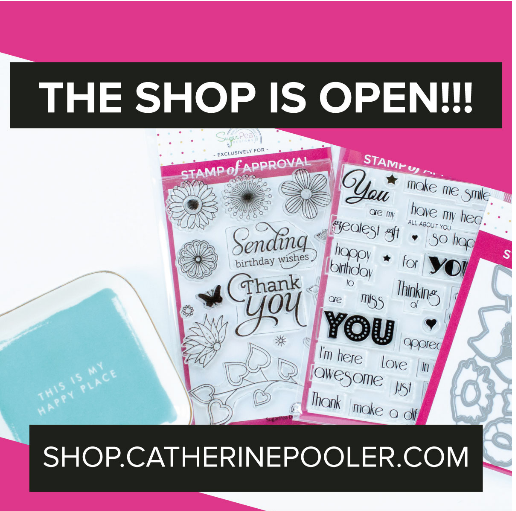 Exciting news about the shop! 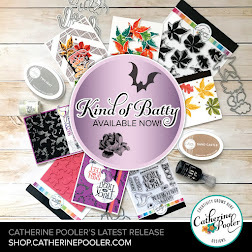 Love your pretty card! I have that set! Thanks for another example of how to get a cool look. Beautiful card! I love ht colors you used. I love gray and pink!! Fun card with just the right amount of colorful "pop". Wow I love this background, can't wait to try this one tonight. I have the stamp so I love new ideas! The colors catches you eye. That's a really colorful card! Thanks for sharing! Great card! Love the design and colors. Always love your cards Maureen! I love the pink and grey combination! GORGEOUS card, Maureen! I love how that pink just pops off the card against the silver and black. Beautiful! I love the geo builders and can't wait to get a set. The color combination was wonderful. What a striking card, Maureen! I especially love the color combination, so much so that my own next card will include silver, pink, and black. I think the GeoBuilder is my favorite stamp set! And I love the colors oyu used. Fabulous! Your cards are always fabulous! Just my style -- great colors and just the right amount of layers and embellishments. Love the use of the stamps. Such talent. Love your creative use of the GeoBuilders set! Beautiful card! I love the colors you used. Thank you for sharing how you made it with us. Love your card! I can't wait to get my own Geo Builders set! Great card! I ordered my Geo Builders set this afternoon!! Love the card. The idea is unique and something I will be sure to try. Oh this is a beautiful card, it is subtle, but I love how the pink just stands out, as in a bold color affect. Really cute card! Love the use of the large die cut on top of the tag. Maureen, Love the card, nice background and lovely colours, Cheers Anna. I love the background that you made with the GeoBuilder stamp set. Very creative. The colors you used are just perfect for this card! Love these pattern card, this card is amazing. I love your card Maureen and your choice of colours. Beautiful card, love the pink/gray color combo and the Geobuilders is going into my shopping cart! Great card, love the pink & grey combo! What a pretty background on your card. I really love the simplistic layout. It is simple, but very elegant. Great job! I love this set! I may have to look into buying a set! You're right about the Geo Builders! I've been waiting for the store to open so I could get it! - and the Girlfriend set - and so many others! I'm trying to pace myself! Your card is amazing! I love the background and can't wait it make my own! Thanks so much for sharing your talent! Stunning! The bright pink with black gets your attention immediately. very pretty! love the background!! I just purchased the geo builder stamp set. Your card design is lovely. I absolutely love this card! Just need to find some silver ink. Fantastic card Maureen! 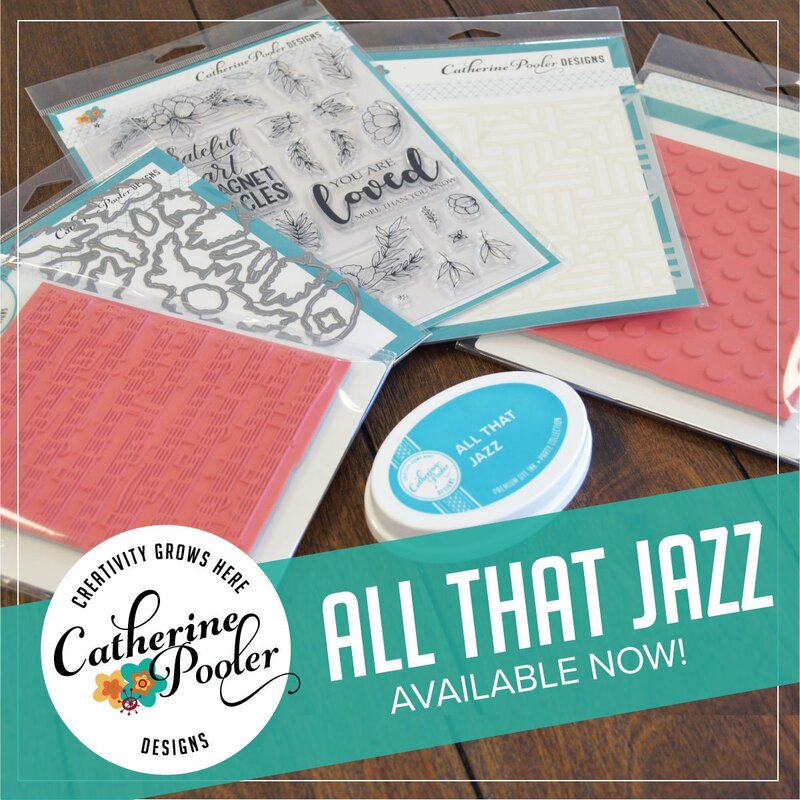 I have the Geo Builder stamp set and there are so many designs to make with it. I can't wait to try this design. 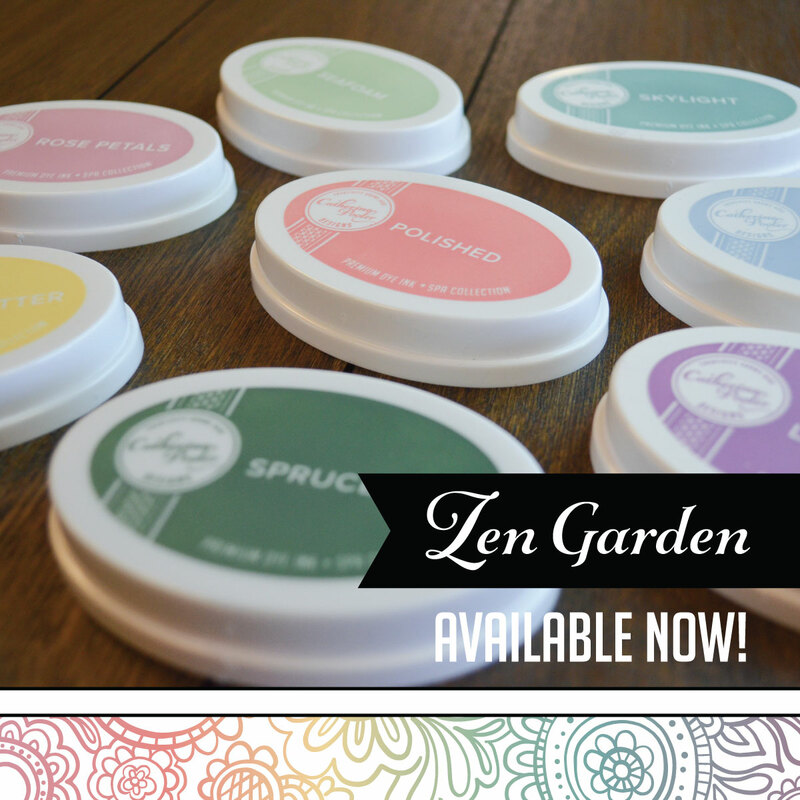 Beautiful products - so glad they are available outside the SOA boxes. ooooo I love the geobuilders stamp set and I love the way you have used it for this card! So pretty! So glad I have this stamp and now I have even more inspiration to use it! Thankyou! Gorgeous card! I love the background you created and that pop of pink! 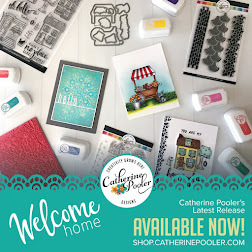 Love your card and the geobuilders stamp set, I have it and use it a lot, it is so versatile! I also love your colour combination, very pretty. great card. I love the neutral colors with just a pop of pink. Very eye catching. I love the colors on this card. Great job! Love the card. You always have great ideas. What a great card and I love the colors! Geobuilder is my favorite stamp, and I love your beautiful card! wait to play with it!! Fabulous color choices and fun card! Love the background that is sure a fun stamp set! Love your card! Your cards are always so awesome! I love the background and the colors used here! Love your card Maureen! You have inspired me to get the geometric stamps out to attempt a CASE! Love the pop of pink on the card! You have been missed this summer, but I am so glad that you have had fun creating memories with your family. Family first always! Hmmm, I may have to invest in the geobuilders now. Thanks! So excited cause now I can copy this gorgeous card! I love the background used here! Awesome patterns and color combo. I love the background of this card. Such a good use of SOA stamps. I've got to give it a try. Love the color combo. There's something about pink black and grey. It's so fresh yet elegant... Kind of a Audrey Hepburn look. Pretty friend card. I plan on shopping soon. What an awesome way to use the geobuilder set! Fabulous The hot pink and grey are stunning together. What a fab background you've built! The possibilities with this set are endless! Love the Geo builders set...your design really POPS! Such a happy card! So cute. Oh wow!! This stamp set is co cool!! I LOVE the colors you used! I love the pop of pink with the gray. Love it all! The stamps, colours and design! Isnt the geo builders set awesome? I need to get me some time off work with mine! Great job and love the card! I like the card. how did you get everything so straight looking? Love your background on this card. It's eye catching at first glance then your beautiful tag and friend grabs my attention. Terrific! Love your use of pink and gray! Very creative card! Love it! OMG! I love this card! I am going to have to case this one. I love the way you did the background and I love the colors. Love your use of the tag and twine on top of a card that looks like patterned paper. It's so imaginative! What a lovely and fabulous card with tag. Love it! Wow!! I really, really love this card! Such unusual colors and patterns. Can't wait to see other cards using these wonderful stamps. Thank you. Such a great card! Very creative and so cool! Such a unique card...just so many aspects of it, using several stamp sets from different collections. 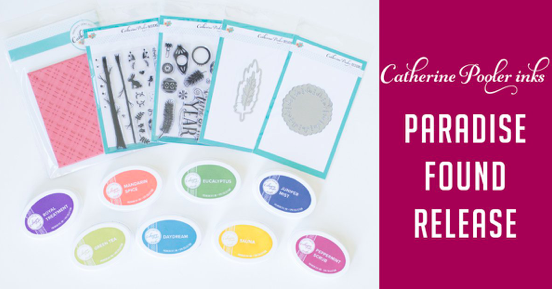 You are right about this stamp set...it's awesome and I see so many possibilities using it. The colours are fabulous and I love the background you created! Loved the background. Thanks for all the ideas.